Soybean acreage in the U.S. Soybean maturity is classified in different groups (MGs) ranging from 000 for the very early maturing varieties to 9 for the later. Gradations within MGs are also commonly noted by adding a decimal to the MG number. A variety is classified to a specific MG according to the length of period from planting to maturity. This phenological attribute is determined by photoperiod and temperature, and these factors can dictate the most suitable MG for a particular geographical location. 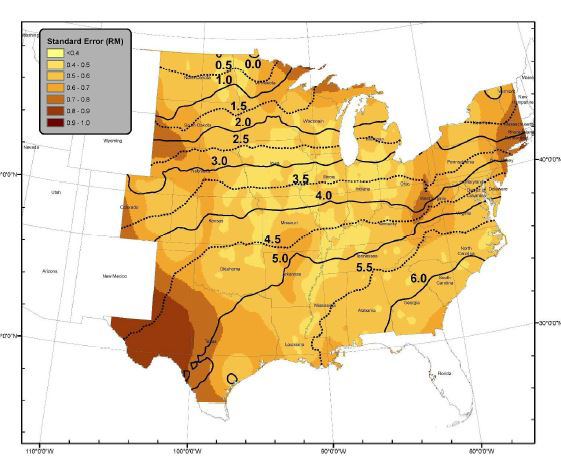 The study that first defined hypothetical MG adaptation zones across the United States was conducted 45 years ago; the most recent study of MG zones incorporated data up to the year 2003. Although photoperiod remains constant, climatic conditions, management practices, and soybean genetics have all changed during the past decades. 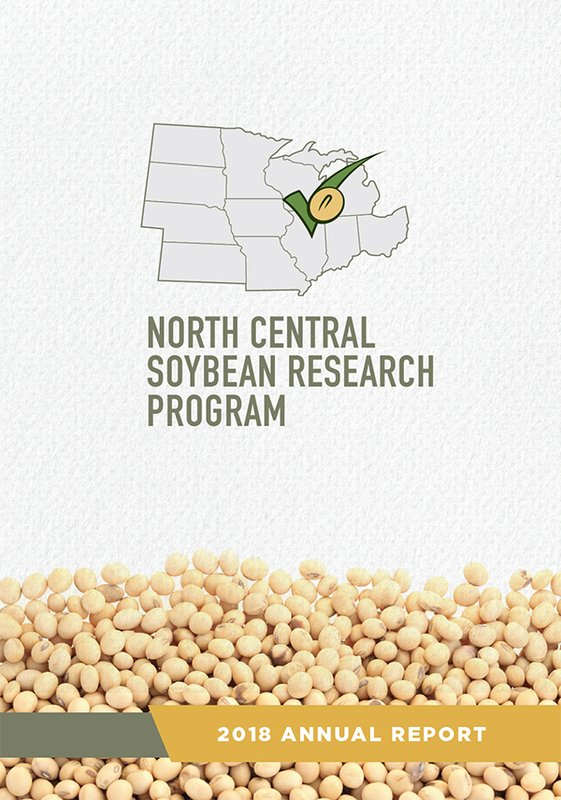 With funding support from the Wisconsin Soybean Marketing Board and the North Central Soybean Research Program, we re-delineated soybean MG adaptation zones across the U.S. using current soybean genetics and climate conditions. Soybean MG-specific yield data from variety trials conducted in 2005-2015 were aggregated from 312 locations across the US. Seven MG zones were identified starting from MG 0 in North Dakota to MG 6 in southern Georgia and South Carolina. The map of optimum MG adaptation zones shows that MG 0 varieties are best adapted to the region north of latitude 47°N, which covers most of North Dakota, northwestern South Dakota and northern Minnesota. 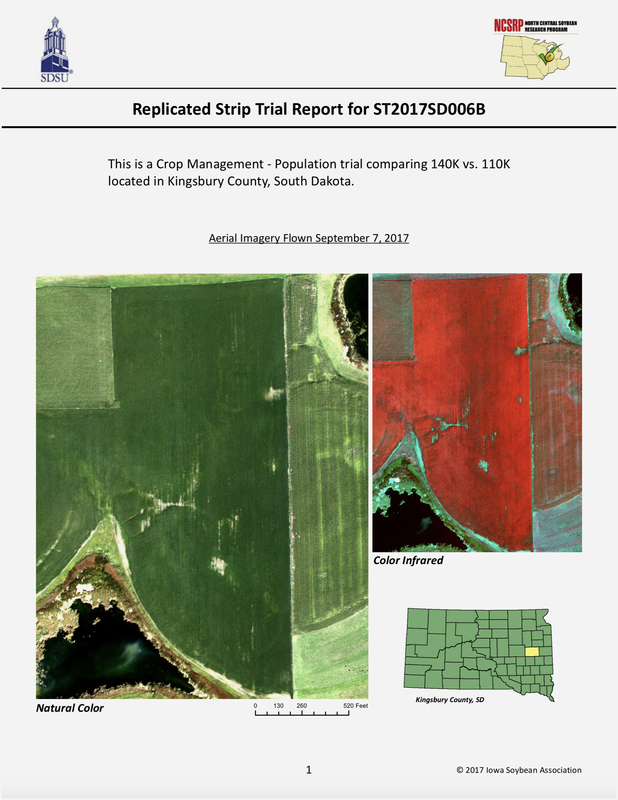 MG 1 varieties are better adapted to central and north South Dakota, central Minnesota, northern Wisconsin and Michigan, and entire New York whereas, the areas from southern Michigan, Wisconsin, Minnesota and South Dakota extended across northern Iowa and Nebraska are better suited for MG 2. MG 3 varieties are adapted to the major soybean producing states, such as the southern half of Nebraska and Iowa, central Illinois, central and northern Indiana, the entirety of Ohio and Pennsylvania, the northern half of Missouri and Kansas. For the complete report and maps, see Delineating Optimal Soybean Maturity Groups Across the United States.